This enormous device was built in 1917. It is located at the former eastern terminus of the Reading Railroad, on the Arthur Kill. 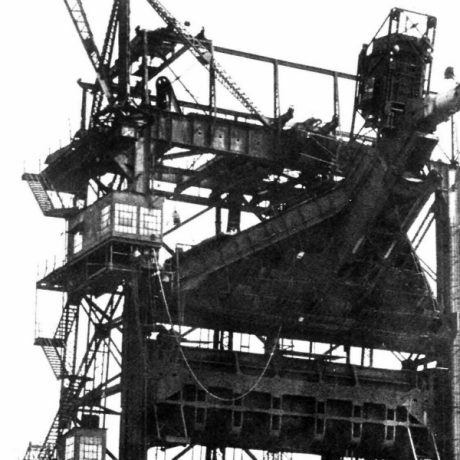 The last of eight that once graced the New York metropolitan area, the apparatus lifted into the air coal filled hopper cars weighing up to forty-five tons. It then turned them upside down, and, as its name implies, dumped the coal into waiting sea-going barges. Seriously damaged by fire in 1951, the apparatus was repaired and it remained in use until 1982. The company that owns the site is seeking to redevelop Port Reading. They have agreed with the New Jersey Department of Environmental Protection and the U.S. Army Corps of Engineers, both of which are involved because the site is considered a brownfield, to seek an alternative to destroying this extraordinary piece of industrial history. But its prospects are uncertain because saving it in situ will be difficult and moving it to a new location more so.